The Golbat that Green took from Koga two years ago happily returns to its original trainer, and the man orders it to show them where the enemy hides with its supersonic. The blue bat starts emitting sound waves across the room, and instantly displays what it detected on its mirror-like mouth. Koga notices a dark shadow moving in the caves behind, and quickly hurls a pokeball that is modified like a ninja star towards it. The creature reveals itself to be an Arbok, and Green realizes they are up against Agatha. Green is about to call out his pokemons when Koga tells the boy to leave it to him. The ninja-star shaped pokeball releases the man's own Arbok, and a snake on snake battle begins. Agatha's Arbok starts off with a leer, but Koga orders a haze from his Golbat to restore the stat change. The man asks with a grin if Agatha is too afraid to show herself, and the old woman giggles that she feels more like the evil person people refer her as by staying in the dark. 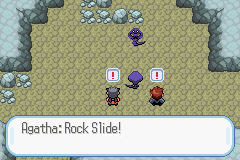 Green is still trying to locate Agatha when her Arbok unleashes a rockslide attack. The two begin to dodge, but Agatha laughs and tells them to watch out for falling objects other than boulders. A barrage of stalactites start plunging down and knocks Golbat to the ground. Green quickly pushes it out of the way just as a stalactite smashes into the ground where it landed. Another shadow emerges out of nowhere and licks Green on the face, and the boy immediately feels his vision disappearing from the paralytic effect. Agatha laughs that Green committed the same mistake of caring too much about others like two years ago, and orders another rockslide from her Arbok. A new round of falling stalactites knock the only paralyz heal Green has off his hand, and slowly separates the boy from Koga by sealing off the space between the two. Koga grunts that their original plan to work as a team no longer works, and decides to face Agatha's Arbok alone. Stuck on the other side of the stalactite barrier with Koga's Golbat, Green has completely lost his vision and decides to count on Golbat's supersonic for directions, but a different sound wave pattern suddenly interrupts and Agatha's Golbat appears to strike at them. Agatha materializes in front of her Arbok and greets Koga as the Fuchsia gymleader. She remarks that she feels a sense of closeness to him as they both use snake pokemons, but says the Elite 4 are much more skilled then gymleaders. She blows out a puff of air from her mouth, and the belly patterns of her Arbok begins to change. Koga gasps in shock, and the old woman explains that different belly patterns give Arboks different special abilities. She grins that the current pattern favours speed, and her Arbok quickly wraps itself around Koga before he could react. Agatha then changes the pattern to favour attack and orders the cobra pokemon to tighten itself around the man.